In most developed countries in the world, Constitutional Courts or Constitutions Councils have been set up with the prime motive of dispensing crucial constitutional matters by going though judicial reviews. In the words of political scientists, a constitutional court is a high court, that deals exclusively with constitutional law. It’s main function is to determine independently with sound caution whether the laws and enactments brought before the parliaments or legislatures are constitutionally valid. When they are challenged by various quarters, social groups and citizens the constitutional courts should decide whether those laws or resolutions are in conflict with constitutionally established rules, rights and freedoms, among other things. In short, a constitutional court is an independent and autonomous state authority which carries-out constitutional review. It is well defined by constitutional expert, ALEC STONE SWEET as a “constitutionally established, independent organ of the state whose central purpose is to defend the normative superiority of constitutional law within the juridical order”. The recorded history of constitutional courts reveals that the first constitutional court was established by the First Austrian Republic in 1919. The Czechoslovakian Constitution of 1920, which came into effect on February 2, 1920, also established a dedicated constitutional court for judicial review of parliamentary affairs. The Supreme Court of the United States of America is also equally regarded as a pioneer supreme court because it is regarded and honoured as a pioneer court in the world to invalidate a law as unconstitutional (MARLBURY VS MADISON). It is still maintaining the same status as a constitutional authority. The concept or a proposal for the setting up of a constitutional court for Sri Lanka is NOT a new thing. The 1972 first republication constitution, a brain child of Dr. Colvin R De Silva established a constitutional court under clause (54) of the new constitution. This constitution is firmly regarded as a home grown constitution, as it emerged through a constitutional assembly especially carved out for this purpose. (e) The Constitutional Court on being moved by any citizen within a week of the Bill being placed on the Agenda of the National State Assembly, advises the Speaker that there is such a question. (3) No proceedings shall be had in the National State Assembly in relation to a Bill referred to the Constitutional Court under sub-section (2) of this section or of section(55) until the decision of the Constitutional Court under sub-section (4) of this section or its opinion under section 55has been given. (4) The decision of the Constitutional Court upon a reference under section (2) of this section shall bind the Speaker and shall be conclusive for all purposes. No institution administering justice and likewise no other institution, person or authority shall have the power or jurisdiction to inquire into, pronounce upon or in any manner call in question a decision of the Constitutional Court. 55(4) If the Constitutional Court advises the Speaker that this Bill or any provision therein is inconsistent with the Constitution or that the Constitutional Court entertains a doubt whether the Bill or any provision therein is inconsistent with the Constitution such Bill shall not pass into law except with the special majority required for the amendment of the Constitution. The following bills were referred to the first constitutional court thus established under the 1972 first republican constitution. (a) SRI LANKA PRESS COUNCIL BILL (b) BRIBERY (SPECIAL JURISDICTION) BILL (c) PLACES AND OBJECTS OF WORSHIP BILL (d) ASSOCIATED NEWSPAPERS OF CEYLON, LTD(SPECIAL PROVISION) BILL & (e) ADMINISTRATION OF JUSTICE BILL . J.R. Jayewardene assumed political power in 1977 and in 1978 a new constitution was drafted and came into being, without going through a constituent assembly. The rationale behind the making of this constitution was to create a weak parliament and a strong Executive President. However, even the United National Party which backed the 1978 constitution totally without questioning a single clause in the 02nd Republican Constitution now takes the leadership with other co-partners in the parliament to move for a new constitution. It insists that the executive presidential system of government with wide powers inherent in a single person is not suitable for a parliamentary system of government. It should be noted here, with appreciation that some of the powers exercised by the President were removed when the new government came in to power in 2015. The Janatha Vimukthi Peramuna very rightly had moved a private members motion in the parliament to do away with the executive presidential system of government and also to move all parties to establish an entirely a new constitution in accordance with enshrined principles of democracy, human and fundamental values. One of the first critics of the executive system of presidential government was Dr. N. M. Perera, who is widely regarded as an constitutional authority. In this connection, the scientific analysis he is making in the ‘CRITICAL ANALYSIS OF THE 1978 CONSTITUTION IN SRI LANKA’, is significant and the failure of the present constitution was analytically predicted long ago, actually speaking in the drafting stage of the present constitution. Dr. Colvin R De Silva, who has written a splendid forward to this valuable thesis says “In 1931 both males and females above the age of 21 in Sri Lanka were enfranchised. 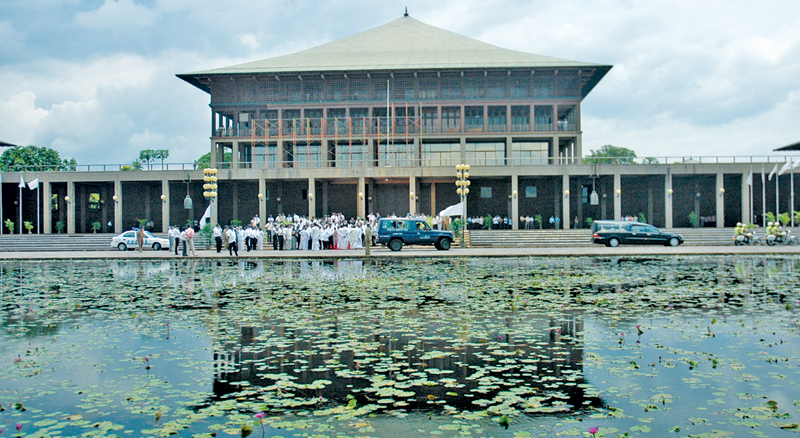 Thereafter, the 1948 constitution which granted Dominion status to Sri Lanka established a comprehensive parliamentary system of the British model. The status of the Governor approximated to that of the British constitutional monarch. The real centre of governmental power was the Cabinet of ministers, headed by the prime minister who functioned with responsibility to, and in accord with, the parliament. …….The Jayewardene constitution abolished the concentration of state power in the National State Assembly, now renamed Parliament, and reposed such power in an executive president elected directly by the people. With state power decisively in the President’s hand and with Parliament relegated to second place, there arises a dualism of power between the President and Parliament. ……..As indicated by Dr. N.M. Perera, such a conflicting situation that could arise out of the constitutional relationship between an elected president and an elected Parliament is a clear possibility”. As predicted by Dr. N.M. Perera very correctly we have seen these conflicts happening throughout with the present system of government. This trend has hampered smooth functioning of democratic governance. Although the 1978 constitution consists only 117 pages, amendments of it goes up to more than 100 pages. This a classic example of the distorted legal character of this constitution. 17, 18 and 19 Amendments also can be classified as evidence of the unworthiness of this constitution. It is full of loopholes of the highest magnitude. Constitutional analysts are also of the opinion, that even the Supreme Court was perplexed, whether the 13th Amendment was consistent or not with the parameters of the 1978 constitution. Therefore, it is clear that inherent weaknesses, legal impediments and excessive authority and concentration of power in the hands of a single person of the above pattern could have been avoided with the presence of a legally instituted constitutional court. I suggest that the drafters of the proposed new constitution will pay their attention to this piece of legislation and allow the citizens of this country to challenge any bill or act which undermine people’s power, before a constitutional court. In this connection I would like to invite the attention of the interested groups and scholars to a considered view of eminent legal eagle, Dr Nihal Jayawickrema one time the Secretary of the Ministry of Justice- “The proposal to set up a Constitutional Court, at the apex of our judicial system, may well serve as a catalyst for change, but only if it is realistically constituted and its establishment is accompanied by vitally necessary reforms in respect of the language of the law and in establishing judicial accountability. One immediate consequence of the establishment of a constitutional court will also be to enable the other superior and first instance courts to focus entirely on civil, commercial and criminal litigation. That task, of course, need to be facilitated by long overdue structural and systematic reforms, responsibilities which neither the Ministry of Justice, nor the judiciary, has so far demonstrated any indication to undertake’.